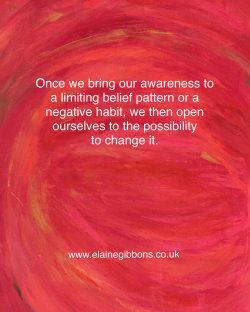 Once we bring our awareness to a limiting belief pattern or a negative habit, we then open to the possibility to change it. We are unlimited beings, living with unlimited possibilities and abundant choices ahead of us. However, we often feel that we can’t change or that there is no choice – but this is due to our limited thinking patterns and often our habitual way of perceiving our lives. But once we start bringing mindfulness and awareness to our daily life, our daily choices (even though very often we don’t think we are making choices), we then open to realising that we can make different and more conscious choices. This can take a lot of awareness and self-discipline – but it is possible. And it is ultimately completely necessary if you want to create positive life-enhancing changes for yourself. You could think of someone maybe that you know, that you wish to emulate, that is doing something or living in a way that you would like to be living. What thoughts must that person be having about their life – when they look around and view their day to day experiences – that will reflect their current daily reality? For example, think what their thoughts must be around their finances, their living/family situation, their health and well-being, their vocation/career. Then think about what your thoughts are around these things – and have a look at the difference – if it feels like there is a gap between what you are currently thinking about your life circumstances, and your dream life scenario – you need to start taking steps to bring things into your daily life, that help to shift your beliefs in that direction. Gratitude for aspects of your current life is easily the easiest and most effective way to start making those changes in belief. Choose to be happy each day!